Of course, as her bookmark list reveals, Ms. Day uses Delicious to bookmark most articles pertaining to “Dr. Horrible.” But I’m pleased to see that, as of today, of the 105 links to “Dr. 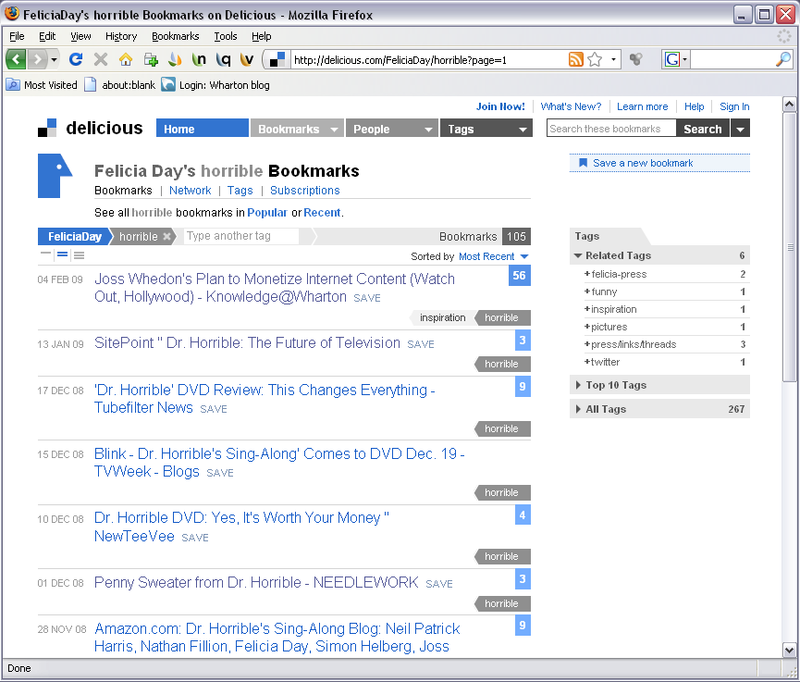 Horrible” items she has saved, my interview is the one most bookmarked by others on Delicious. I’m even more pleased that it is the only one of her “Dr. Horrible” bookmarks that Day has also tagged as “inspiration.” I’m sure she’s referring to Whedon’s insightful comments rather than to my questions or introductory text. But it’s gratifying to think that I played a small role in eliciting those responses from Mr. Whedon. Thanks for the note. I was quite gratified by some of the coverage the Whedon interview received. Although I didn’t blog this, I was particularly pleased that the Writer’s Guild of America included it in the spotlight section of their home page. Here’s a screenshot: Writer’s Guild of America, West.